These came out so nice I'm going to have to keep one for myself. 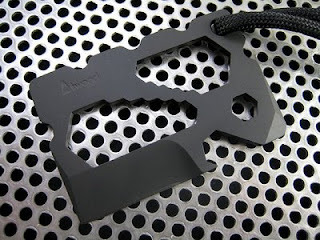 They are a beautiful matte black with black lanyards...very sharp both in looks and in edge. ;) I have a limited number so am keeping it at one per customer. They are $90 plus shipping...this batch sold out. I finished a batch of the G3 Prybabies this morning. The green G2s were so popular that I thought I'd do some of the G3s in green as well. The G3s are not a limited edition although I do not have a whole lot of them this time around. Another batch will probably happen at some point in the winter. At any rate, these are running $70 each plus shipping. I certainly have a LOT to be thankful for this year. I want to thank everyone who has helped me along the way and bought and enjoyed my little tools and knives. I really do appreciate it. 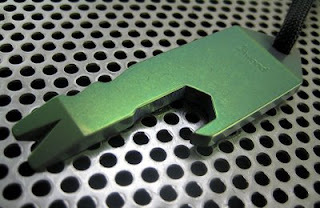 I have some stonewashed G2 Titanium Prybabies that I have anodized a nice green. This is a Limited Edition of 42 pieces and I won't be making them again. These were cut from some thick .160 (5/32) ti sheet which is getting very hard to find these days...they are substantial little tools. 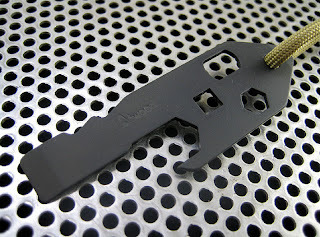 Same exact size as a standard Atwood Gasbaby but without the wrench cutouts. Price on them will be $70 plus shipping. Sold Out! Thanks very much folks! I have just a handful of these available but too many to do a lottery. They are flat titanium Gasbabies that I have blasted and then DLC coated. Great little wallet pieces. I'm sending out emails right now. If you don't hear from me soon and you see your number on the list please email me. Lottery will run until 9PM EST this evening, Monday 24th. I'll get back to the sheaths in a few days as well, just as soon as this grinding session is out of the way. Also, the DLC stuff should be back by next week at the latest so there will be a bunch more of those pieces coming as well as the titanium Prybabies which should be back from tumbling any day now. So stay tuned for a mix of general releases and lotteries coming up in a few days. So, moving right along. 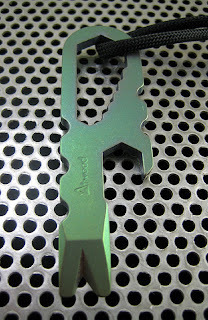 ;) How about this DLC coated, high voltage patterned, one of a kind stainless steel whistle? This piece is quite unique and is one of the very few Atwood whistles with no knurling that have ever been made. There is no name stamp. Pretty neat stuff and it took that patterning rather nicely, shows up better in person than my picture conveys. Anyway, for those not following sports, the New England Patriots will be playing the NY Jets tonight. The drawing will be at halftime, whenever that is. Hey it's a football game! :D Price on the piece is $70 shipped in US, add $5 for international. Lottery is over. Pats aren't doing so well but maybe they'll rally. Winner is #44 cpcc3830. Thanks folks! I just started grinding these yesterday so it will be at least two weeks or so before they are completed. But the good news is they are finally in the works....total length on these is 3.5" so they are a bit longer than a regular Prybaby®. I may also do a shorter metric version up the road without screwdriver end. Metric sizes 6,8,10,12,14,16mm. SAE sizes 1/4, 5/16, 3/8, 7/16, 1/2, 9/16. Thank you folks for the interest. I will have more coming up this week and a general release of some sort pretty soon as well. 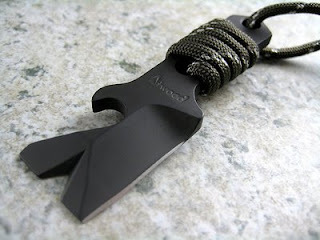 I have just three of these Micro Bug Out Blades with DLC coating and OD green cord wrap. 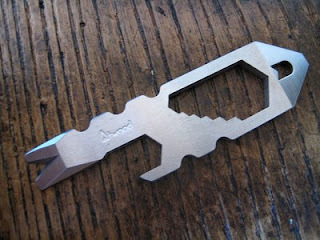 These are the very last of the Micro Bug Out Blades and as of now I have no plans to make more. 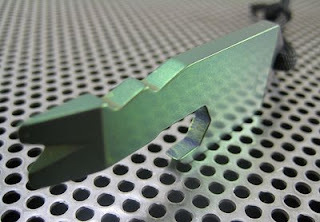 They are made of the great Crucible tool steel CPM 3V so they are incredibly tough and hold a terrific edge. 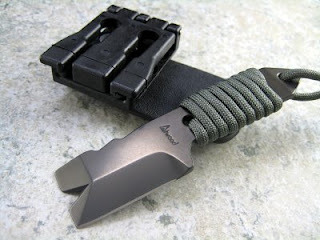 Each will come with kydex sheath and removable teklok belt clip. Price is $180 plus shipping. Thanks everyone, this was a lot of fun. I have sent emails to all the winners and if you are one of them and do not get the email for some reason, please email me. Hey Everyone! I'm back after a few days of shop maintenance, yard work and trade show attendance. I'm back in sheath making mode and finally have some more Mini Son of PryThings to offer. These are matte blasted and coated with DLC. 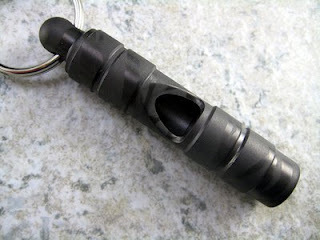 The cord wrap and lanyard is a high grade paracord with a glow in the dark accent fleck. Really nice stuff. 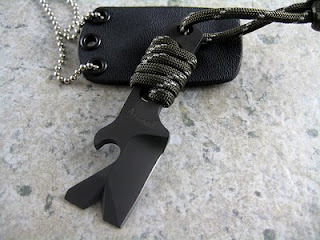 These come with a kydex sheath with bead chain. Anyway, I have 11 of these DLC MSOPThings available. Price will be $180 each plus $8 shipping in the US and $26 shipping via Express Mail worldwide.